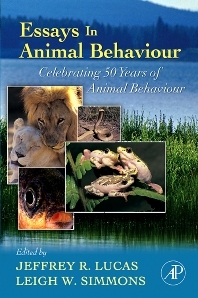 Recently, the 50th anniversary of the publication of Animal Behaviour has passed. To mark the occasion, a group of prominent behaviourists have written essays relevant to their fields. These essays provide a glimpse of the study of behaviour looking in all directions. History and future aside, it is imperative to broadcast this information from the perspective of the behaviourists who have helped shape both the past and the future. It is important for any field to be both retrospective and prospective: where have we been, where are we going, where are we now? These essays provide a unique personal reflection on the history of animal behaviour from John Alcock, Stuart and Jeanne Altmann, Steve Arnold, Geoff Parker, and Felicity Huntingford. Six topics are reflected on and include: The History of Animal Behavioural Research, Proximate Mechanisms, Development, Adaptation, and Animal Welfare. Jeffrey R. Lucas & Leigh W. Simmons. 50 years of Animal Behaviour. John Alcock. A textbook history of animal behaviour. Stuart A. Altmann & Jeanne Altmann. The transformation of behaviour field studies. Stevan J. Arnold. Too much natural history, or too little? Gene Robinson. Genes and social behaviour. John Wingfield. Control of behavioural strategies for capricious environments. Andrew I. Barnes & Linda Partridge. Costing reproduction. Patrick Bateson. The promise of behavioural biology. Bennett G. Galef. Making a decision by integrating socially and individually acquired information. Judy Stamps. Behavioural processes affecting development: Tinbergen's fourth question comes of age. Meredith J. West, Andrew P. King, & David J. White. The case for developmental ecology. Malte Andersson. Interplay between theory and empiricism in sexual selection. Amotz Zahavi. Indirect selection and individual selection in sociobiology: my personal views on theories of social behaviour. Michael Greenfield. Honesty and deception in animal signals. P. J. B. Slater. Fifty years of bird song research: a case study in animal behaviour. Roswitha Wiltschko & Wolfgang Wiltschko. Avian navigation: from historical to modern concepts. Marian Dawkins. Behaviour and animal welfare. Purdue University, West Lafayette, IN, U.S.A.
Leigh Simmons is an ARC Professorial Fellow and Winthrop Professor at the University of Western Australia. He studied at the University of Nottingham where he recieved his PhD in 1987. He has held a research fellowship at the University of Liverpool UK before moving to Australia. His research uses both vertebrates and invertebrates to test the predictions and assumptions of theoretical models of sexual selection and life history evolution. Collectively, these research programs seek to determine the direction and strength of selection acting on male and female reproductive strategies, and on the morphological and life history traits that contribute to fitness, from the whole organism to its gametes. He has published more than 280 papers and articles, authored a book on insect sperm competition, and co-edited a volumes on dung beetle ecology and evolution, and insect mating systems. He has had extensive editorial experience with many journals including Proceedings of the Royal Society B, Behavioural Ecology and Sociobiology, and is a former Executive Editor of Animal Behaviour. He is currently Editor-in Chief of Behavioral Ecology, and has been an Editor of Advances in the Study of Behavior since 2009. He was elected to the Australian Academy in 2009.